The Plesk Mobile application for iOS and Android enables you to access your Plesk account anytime and anywhere, right from your smartphone. 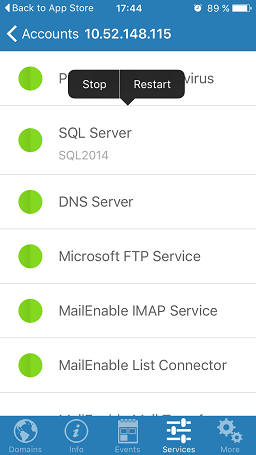 Using Plesk Mobile, you can easily manage your domains on several Plesk servers, smoothly switching between them. If you are a Plesk administrator, you can also access a number of important server management features. Working in Plesk Mobile is just as convenient as in the Plesk user interface. In addition, it makes a number of scenarios, such as entering strong passwords, or managing multiple Plesk servers, much less awkward than when you browse the Plesk user interface from a mobile device. Just add several servers and accounts in the application and manage them without the need to enter the password every time. Managing your domains transparently, navigating the Plesk interface, or using File Manager. Viewing the server information, including statistics and resource usage. Managing services on a specific server. Managing the Plesk license on a specific server. Browsing the Plesk interface in embedded web view without authenticating. Note: Plesk Mobile is currently not available on Windows Phone. Instead, you can download and install the legacy Plesk Manager application. This application provides only the server management functionality, without domain management features. 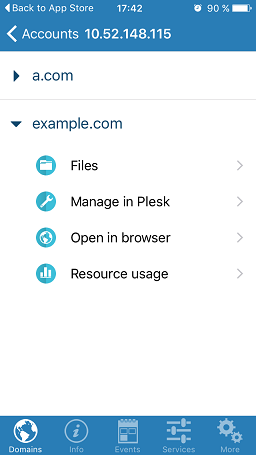 If you are a Plesk administrator, you need to install the Plesk Mobile Center extension on every Plesk server you want to manage with the application. 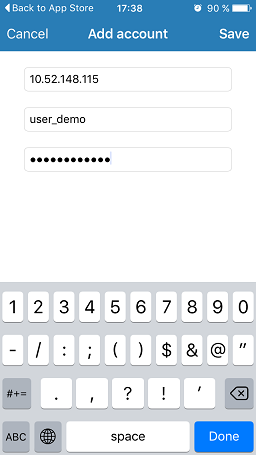 Plesk suggests installing the extension when you start the application for the first time (see the First Login to Plesk Mobile section below). Alternatively, you can install the extension via the Plesk interface, from Extensions > Extensions Catalog > Plesk Mobile Center. Define the verbosity of the log file, that is located at %plesk_dir%/var/modules/plesk-mobile/MobileConnector.log (the same path on Windows and Linux), where %plesk_dir% is the path to the Plesk installation directory. Enable Push notifications. Such notifications enable your device to inform you about important events, and they are enabled by default. When you run the application for the first time, you must add an account. Enter the hostname or the IP address of a server with Plesk, your Plesk login, and password. 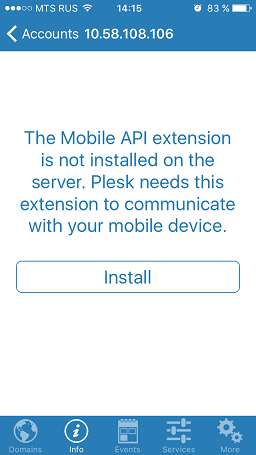 This means that the Plesk Mobile Center extension is not installed on the Plesk server you are trying to manage. Click Install to install the extension. For site owners and administrators, Plesk Mobile provides the site management functionality. Administrators can manage sites on the Domains tab. Manage the web site files using the File Manager. You can edit files in the embedded simple editor or using some more fully featured third party app. Manage your site transparently navigating the Plesk user interface. Open your site in a web browser. See the resource usage of your site, including disk space and traffic. Additionally, you can see the number of used domains, subdomains, mailboxes, mailing lists, databases, and web users in your subscription. Note: The information about the number of used subdomains and web users is available in Plesk Mobile for iOS only. If a new domain has been added on the server, you can refresh the domain list by pulling the screen down. Note: In Plesk Mobile for Android, you can also add your favorite or most often used features to the application as quick links. For more details, refer to this article on the Plesk developer blog. 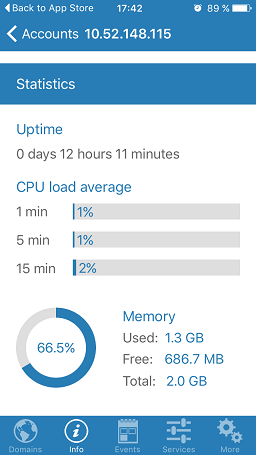 Server statistics, including uptime and CPU usage. Data transfer for different protocols: HTTP, FTP, SMTP, POP3, and IMAP. General server information like version, operating system, CPU and Container ID (if Plesk is installed in a Virtuozzo container). Plesk Mobile allows you to subscribe to a number of Plesk events, such as a Plesk service starting or stopping, license expiring, the domain limit being exceeded, and more. Most recent notifications will be displayed on the Events tab. 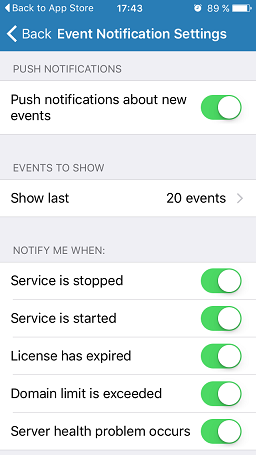 To configure the notifications for particular events, tap Edit on the Events tab (on iPhone) or go to More > Event Notification Settings (on Android). You can view, start, stop, and restart services on the Services tab. Open the native Plesk user interface. 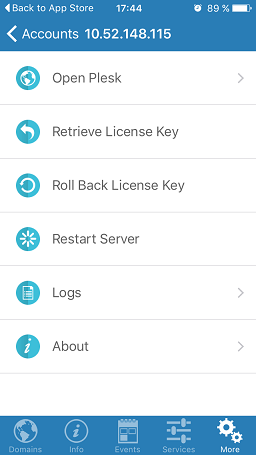 Retrieve and roll back the Plesk license key. Restrict access to the server (on Android). Configure event notifications (on Android). Browse Plesk error and access logs. View the information about the application, rate it, or report an issue.